Ryan Devon is a registered dietitian with a Master of Science in nutrition and health promotion from Simmons College. He starting writing in 2010, specializing in weight management and eating-disorder science. Approximately 20 million adults suffer from a peptic ulcer sometime in their lives, the University of Maryland Medical Center reports. Stomach ulcers are a serious medical condition that increase the risk of stomach infections and chronic gastrointestinal pain. In addition to the advice from your doctor, you may want to consider taking probiotics to help your ulcer. Peptic ulcers are the result of an infection from a specific type of bacterium known as H. pylori. An overgrowth of H. pylori in the stomach can degrade the thick lining of your stomach. A thin stomach lining can cause your stomach's acid to damage and destroy your stomach's tissue. Rick factors for peptic ulcers include obesity, use of nonsteroidal anti-inflammatory drugs, stress and diabetes. Probiotics may help fight the H. pylori bacteria that's wreaking havoc inside of your stomach. According to a review paper published in the April 2006 "Alimentary Pharmacology & Therapeutics," there's sufficient evidence that probiotics can help reduce the risk of and boost recovery from a peptic ulcer. For example, a 2001 research study conducted by scientists at Taiwan's' National Cheng Kung University found that supplementing with the dairy-derived probiotic Lactobacillus helped boost healing time in a group of 100 H. pylori-infected study volunteers. Probiotics attack H. pylori infections in a number of ways. The aforementioned "Alimentary Pharmacology & Therapeutics" paper notes that probiotics produce large amounts of bacteriocins--atural antibiotic compounds. Also, probiotics compete with H. pylori for resources such as oxygen, food and space. Probiotics also reduce inflammation in the stomach. While small amounts of inflammation can aid in the healing process, too much inflammation can interfere with the healing of your stomach's lining. Finally, probiotics help make the lining of your stomach stronger and more resilient to damage. As with all dietary supplements, probiotics should not be taken unless approved by your physician. Also, probiotics alone may not help your ulcer. Probiotics work best when combined with antibiotic and lifestyle therapies such as losing weight, exercising, eating a healthy fiber-rich diet and tobacco avoidance. Sources of natural probiotics include kimchi, kefir and yogurt. Are Probiotics Good for Gastritis? 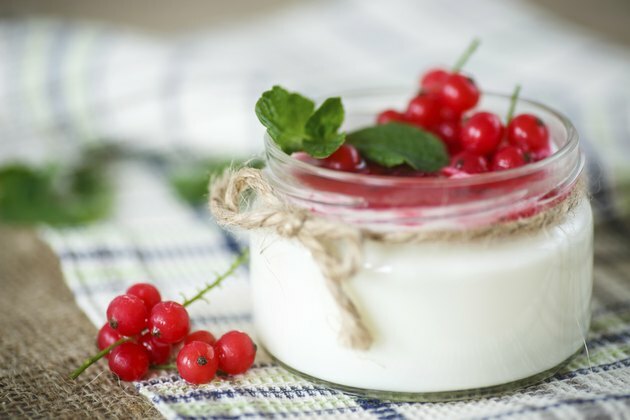 Can Probiotics Be Harmful to Cancer Patients?